12 Karat Gold Filled and real Red Oyster Shell. Necklace measures approximately 22-1/2" long and weighs 67 grams. Hook dangle earrings measure approximately 1-5/8" long (including hook) and 5/8" wide. 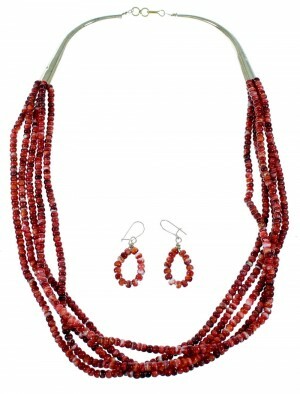 There is nothing at all average about this beautiful necklace set! This piece of Native American jewelry is Navajo hand strung out of 12 Karat Gold Filled, along with real 4-mm Red Oyster Shell round beads. 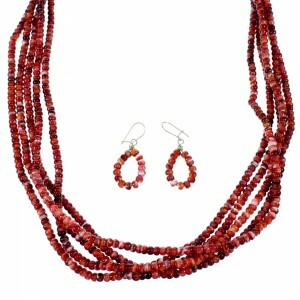 The necklace consists of FIVE strands, and can be worn one of two ways, loosely around the neck or slightly twisted for an additional fashion statement. 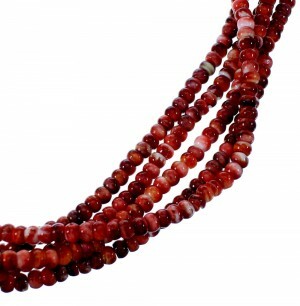 Each end of the necklace is completed with a 12KGF cone for a beautiful look. The cones are stamped G/F. 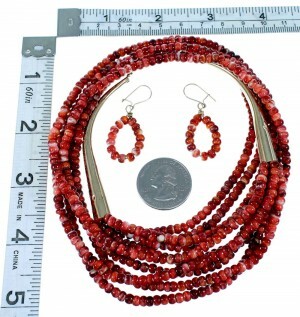 The earrings perfectly match the necklace, and consist of: 4-mm Red Oyster Shell round beads.